The New South China Mall in Dongguan, Guangdong province in southern China is one of these ‘white elephants’. I was taken there on a road trip showing the extremes of Chinese development. I wrote the below short article on my impressions of that day (written in april 2010). The Pearl River Delta is the main economic region in China and the two main cities, Shenzhen and Guangzhou, are some of the richest cities in the country. We spent the day driving to see some extremes of China – a good change from being in meeting rooms in Beijing for the four days before. Shenzhen actually surprised me. The city has transformed in 30 years from a small fishing village across from Hong Kong to a major, modern city filled with high-tech companies. It was the first Special Economic Zone in China, announced in 1978 as part of Deng Xiaoping’s Open Door policy. It sparked tremendous growth for the region and ultimately made the Pearl River Delta into the production powerhouse of the world. A lot of the cheap toys and computer components which are ‘made in China’ are likely to have been made here. So in my mind Shenzhen would be a very industrial, factory-filled, dirty & grey, chaotic city. Similar, in fact, to surrounding cities such as Dongguan. Surprisingly it was much better than that. We visited Shenzhen to meet with an architect from OMA who is working on the construction of the building for the Shenzhen Stock Exchange. And this is only one of many buildings under construction with some other top designed buildings close-by. The wealth of the city is clearly showing. But to show me that China isn’t all about amazing growth rates, spectacular buildings and more, my colleague also took me to the biggest shopping mall in the world. I guess it’s another symptom of China’s development where everything needs to be bigger and better. But bigger doesn’t always mean better, as the New South China Mall clearly shows. At first we thought we were in for a disappointment. Driving up to the mall we saw shops, people, lights and, well, activitiy. This wasn’t what we were coming for. Because apart from it being big, we were told it would also be empty. When we walked in behind the McDonald’s we were relieved to see this was true. Five floors and corridors going off in every direction, but no shop in sight. It was clear that there had been some shops at a point in time, but everything was gone apart from the Spar, the McD’s and the local drugstore out front. 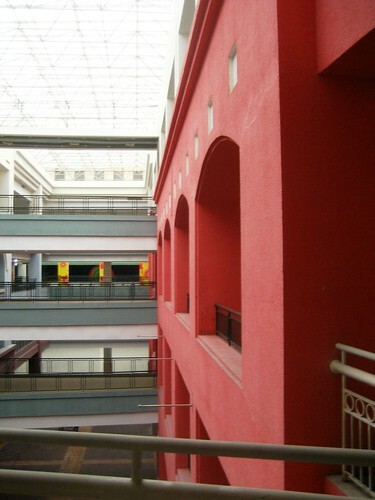 A ghost shopping mall – and an example of how it can go very wrong as well. Haphazard investment clearly doesn’t automatically guarantee growth and further investment. And that ties in nicely with a presentation I attended earlier that week on the Chinese economy. That presentation closed off with the prediction that the current level of high investment is only going to have a negative effect and that China’s economy will crash within the next few years. Let’s see what will happen.